Nursing pharmacology guide for Antitussives. 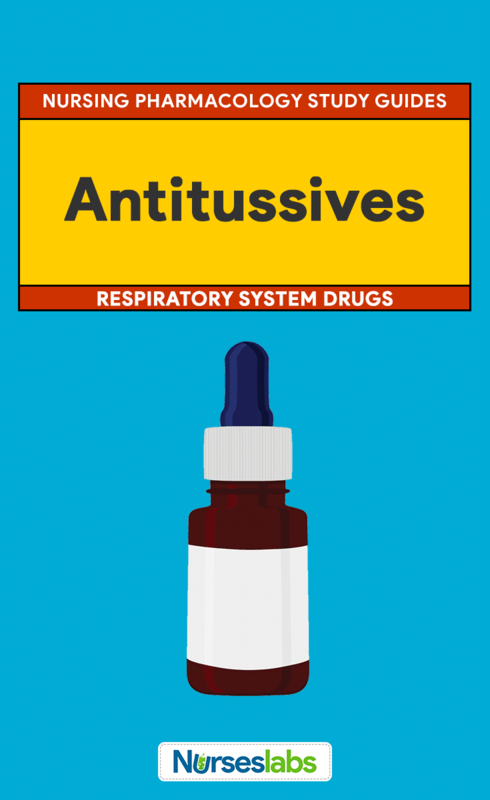 Antitussives are drugs that suppress the cough reflex. Persistent coughing can be exhausting and can cause muscle strain and further irritation of the respiratory tract. Many disorders of the respiratory tract are accompanied by an uncomfortable, unproductive cough. Coughing is a naturally protective way to clear the airway of secretions or any collected material, and antitussives prevent these actions. 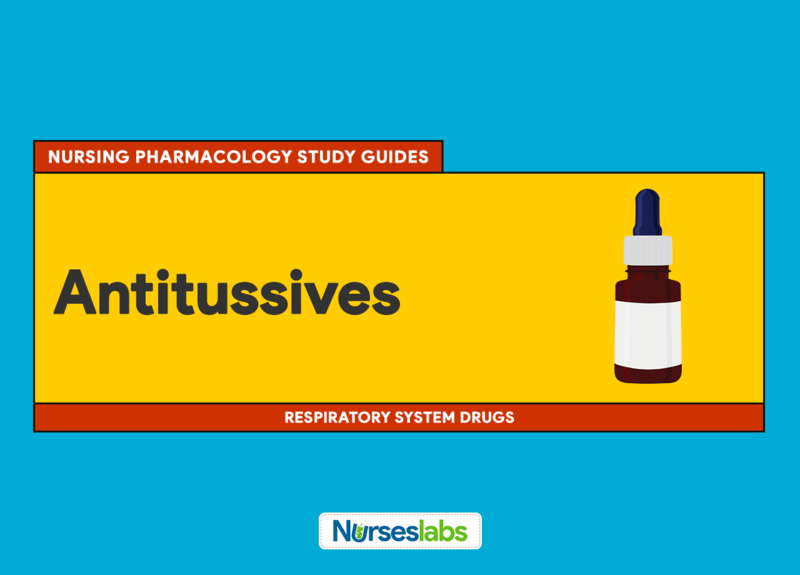 Learn about the uses and nursing care plan considerations needed for patients taking antitussives in this nursing pharmacology study guide. The viruses that cause the common cold invade the tissues of the upper respiratory tract, initiating the release of histamine and prostaglandins, causing an inflammatory response. As a result of the inflammatory response, the mucous membranes become engorged with blood, the tissues swell, and the goblet cells increase the mucus production. These effects cause the person with a common cold to complain of sinus pain, nasal congestion, runny nose, sneezing, watery eyes, scratchy throat, and headache. The swelling can block the outlet of the eustachian tube, which drains the inner ear and equalizes pressure across the tympanic membrane. If this outlet becomes blocked, feelings of ear stuffiness and pain can occur. Acts directly on the medullary cough center of the brain to depress the cough reflex. Because they are centrally acting, they are not the drugs of choice for anyone who has a head injury or could be impaired by central nervous system depression. Local anesthetic on the respiratory passages, lungs, and pleurae, blocking the effectiveness of the stretch receptors that stimulate a cough reflex. For relief of moderate to moderately severe pain. Codeine, hydrocodone, and dextromethorphan are rapidly absorbed, metabolized in the liver, and excreted in urine; they cross the placenta and enter breast milk. Patent airways. Patients who need to cough to maintain the airways (e.g., postoperative patients and those who have undergone abdominal or thoracic surgery) to avoid respiratory distress. Asthma and emphysema. Patients with asthma and emphysema are contraindicated because cough suppression could lead to accumulation of secretions and a loss of respiratory reserve. Sedation. Patients who need to drive or be alert should use codeine, hydrocodone, and dextromethorphan with extreme caution because these drugs can cause sedation and drowsiness. Pregnancy. Patients who are pregnant and lactating, because of the potential for adverse effects on the fetus or baby, including sedation and CNS depression. GI: Nausea, constipation, dry mouth, GI upset. Monoamine oxidase inhibitors (MAOI). Dextromethorphan should not be used with MAOIs because hypotension, fever, nausea, myoclonic jerks, and coma could occur. Assess for possible contraindications and cautions (e.g., history of allergy to the drug, cough for more than 1 week, and pregnancy and lactation). Perform a physical examination to establish baseline data. Monitor the temperature to evaluate for possible underlying infection. Assess respirations and adventitious sounds. Ineffective airway clearance related to excessive drug effects. Disturbed sensory perceptions related to CNS effects. Deficient knowledge regarding drug therapy. Prevent overdosage. Ensure that the drug is not taken any longer than recommended to prevent serious adverse effects and severity respiratory tract problems. Assess underlying problems. Arrange for further medical evaluation for coughs that persist or are accompanied by high fever, rash, or excessive secretions; To detect the underlying cause of coughing, and to arrange for appropriate treatment of the underlying problem. Provide other relief measures from cough. These nursing interventions may include humidifying the room, providing fluids, use of lozenges, and cooling room temperature. Educate the patient. Provide thorough patient teaching, including the drug name and prescribed dosage, measures to help avoid adverse effects, warning signs that may indicate problems, and the need for periodic monitoring and evaluation, to enhance patient knowledge about drug therapy and promote compliance. Provide emotional support. Offer support and encouragement to help the patient cope with the disease and the drug regimen. Monitor patient response to the drug (control of non-productive cough). Monitor for adverse effects (respiratory depression, dizziness, sedation). Evaluate the effectiveness of the teaching plan. Monitor the effectiveness of other measures to relieve cough. Option C: An antitussive is a cough suppressant. Options A and D: Represents the action of an expectorant. Option B: Describe the action of a decongestant. Which of the following pathophysiological mechanisms that occur in the lung parenchyma allows pneumonia to develop? Option D: The common feature of all type of pneumonia is an inflammatory pulmonary response to the offending organism or agent. Options A and B: Atelectasis and bronchiectasis indicate a collapse of a portion of the airway that doesn’t occur in pneumonia. Option C: An effusion is an accumulation of excess pleural fluid in the pleural space, which may be a secondary response to pneumonia. Option D: Patients with asthma need patent airways which coughing could provide. Options A, B, and C: These conditions may warrant the use of antitussives. Antitussives are indicated for which of the following patients? Option C: One of the indications of administration of antitussives is a nonproductive, irritating cough. Option A: Antitussives suppress the cough reflex which could compromise the airway of someone who has difficulty of breathing. Option B: Narcotine addiction is a contraindication for administering of antitussives. Option D: Antitussives are contraindicated for a patient who is pregnant. Use of antitussives is associated with which of the following adverse effects? Options A, B, and C: All of these symptoms are adverse effects of antitussives. 1. Answer: C. Relieve a dry cough. Option C: An antitussive is a cough suppressant. Options A and D: Represents the action of an expectorant. Option B: Describe the action of a decongestant. 2. Which of the following pathophysiological mechanisms that occur in the lung parenchyma allows pneumonia to develop? Option D: The common feature of all type of pneumonia is an inflammatory pulmonary response to the offending organism or agent. Options A and B: Atelectasis and bronchiectasis indicate a collapse of a portion of the airway that doesn’t occur in pneumonia. Option C: An effusion is an accumulation of excess pleural fluid in the pleural space, which may be a secondary response to pneumonia. 3. Answer: D. Asthma patients. Option D: Patients with asthma need patent airways which coughing could provide. Options A, B, and C: These conditions may warrant the use of antitussives. 4. Antitussives are indicated for which of the following patients? 4. Answer: C. Aubry who has dry cough. Option C: One of the indications of administration of antitussives is a nonproductive, irritating cough. Option A: Antitussives suppress the cough reflex which could compromise the airway of someone who has difficulty of breathing. Option B: Narcotine addiction is a contraindication for administering of antitussives. Option D: Antitussives are contraindicated for a patient who is pregnant. 5. Use of antitussives is associated with which of the following adverse effects?